I'll be honest: sometimes, our Second Edition card designs are anything but simple. We've made entire expansions without a "vanilla" card in sight. And you guys have noticed, and have spoken up about how that's not something you like. We noticed, and we listened. As Richard mentioned in his introduction, we started out with quite a few simple, cheap, no gametext (except keywords) personnel in the file, and most of them survived. I also remember discussing in several of our meetings ways to make cards less confusing, more elegant, and cleaner. Those discussions led to quite a few clean ups on cards, eliminating extra fluff that didn't need to be there. We're remembering (or perhaps, realizing) that the adage of "less is more" is very true. I know that we've hinted about this, but I'll tell you that Hard Time started out very differently than where it ended up. We went into the expansion with a lofty goal of adding both new focused decks as well as dilemma piles. We made several mistakes in framing and presenting our new mechanic, designed to help promote lean, mean, tightly focused decks, and decided after a few weeks to change directions. At that point, we decided to go all in on the dilemma theme, and replaced all of the "new mechanic" cards. That was the first major exodus of complexity. Right around the time we made these cuts, we noticed we were getting a fair amount of feedback about the lack of "star power." If you don't know, "star power" is a vague term used to describe the inclusion of famous moments, personnel, and other source material in an expansion. The idea was that popular and well-liked characters will interest some players and lots of potential players. It's somewhat outdated without the need to drive sales. While some of the design team doesn't think it's important, I do. Most of the Hard Time team agreed with me. So, these two issues (needing simple cards to fill holes and lack of star power) swirled around our collective heads until a solution became obvious: make some simple "star" characters! And that's how cards like Lt. Jean-Luc and Ferengi Ben Sisko came to be. This cycle of simple stars (there's five, in total) feature popular/famous characters with simple abilities. In addition, we made one more "tweak" to these cards as we worked on them and made sure they were very good. We didn't cheat the costing chart or anything drastic, but we did use some aggressive rounding to make sure these cards were at the top end of the efficiency scale. In other words, they are all good value. Take Kurn for example. This two cost personnel mirrors his brother, Worf, in some pretty obvious ways. 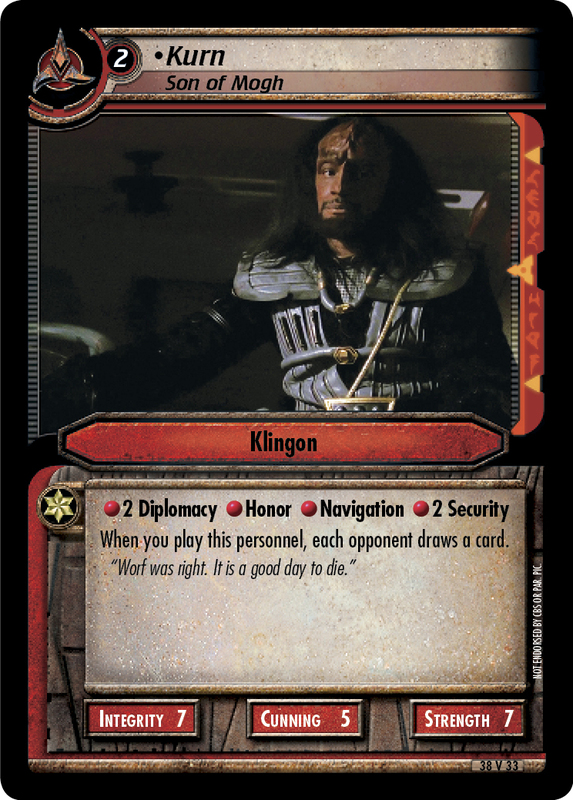 He's not quite as honorable or as strong as his brother, but Kurn brings double Diplomacy and double Security to the party, all for the low, low price of two (2) counters. Tuvok is the same way, offering four (4) very solid skills, a solid attribute line (6-6-7) all for two (2) counters. 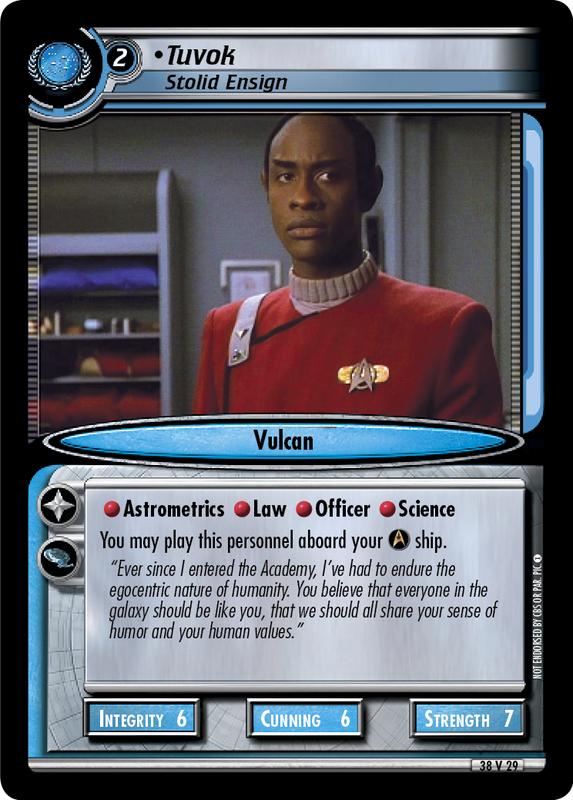 He even adds extra value because he can be played in both Voyager (finally, a low-cost Tuvok) and TOS decks! So, you've seen Picard, Tuvok, Sisko, and Kurn... that just leaves one more. The last one is, without a doubt, the most controversial of the quintet. And I think you could make the case that he's the most powerful of them, too. But I'm sorry, I can't show him off today. In fact, you won't see him until release day (Friday, September 9th). I know, usually I'm more diplomatic with my word choice; usually I'm more intelligent than that. I feel bad, knowing that you're positively green with envy. Just don't be scornful, okay? Enjoy your weekend, and come back next week for a host of new Hard Time spoilers!